Three Southern League franchises are partnering for a round robin competition throughout the 2019 season. 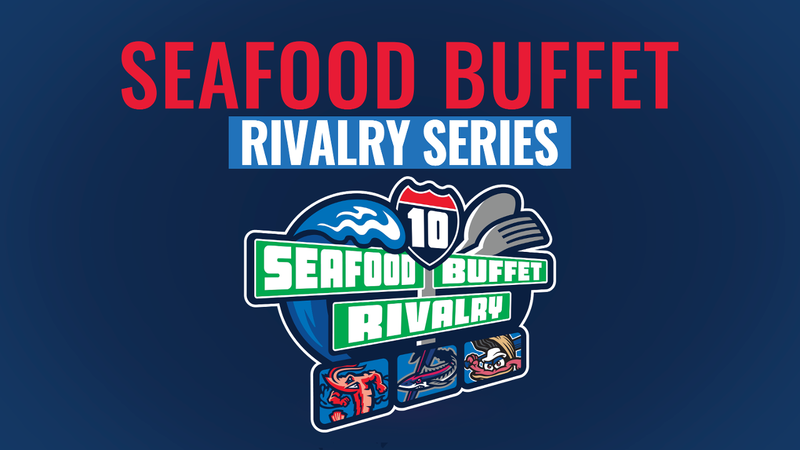 The Biloxi Shuckers, Jacksonville Jumbo Shrimp and Pensacola Blue Wahoos, who are all connected by Interstate 10, will vie for the Seafood Buffet Rivalry Series, bringing the winning team one pound of seafood from each of the losing squads. "We can't wait to get going with the Seafood Buffet Rivalry," said Shucker General Manager Hunter Reed "It's an incredibly unique way for each of these three teams to bring even more excitement to these important division games. What could be better than team pride and good seafood on the line?" The Seafood Buffet Rivalry Series will track the amount of wins each club achieves against the other two Southern League squads in the competition throughout the season. The series will begin when Jacksonville plays at Pensacola in a five-game series from April 10-14. "We thought this was a fun and exciting way to put something on the line and bring some of the franchises with unique nicknames together in our league," said Jumbo Shrimp general manager Harold Craw. "We're hoping the Jumbo Shrimp can come through in the first year of this rivalry series so that our team in Jacksonville can enjoy some oysters and wahoo at the end of the season." "We're lucky to have three great ball clubs with three great ballparks close to water in the Southern League," said Blue Wahoos president Jonathan Griffith. "What better way to celebrate that than with a friendly competition to add a little extra excitement to our games against Biloxi and Jacksonville!" In total, there will be 60 games between the three clubs over the series. Following their five-game road trip to Montgomery, the Biloxi Shuckers will return home from April 15-25 for a ten-game homestand to take on the Blue Wahoos and Jumbo Shrimp.